SAN ANTONIO—Thousands of years before the Mayans created their calendar that famously ends in 2012 and 10 centuries before England’s Stonehenge was erected, people in the southern Jordan River Valley founded a major city and organized massive rocks into circles. “The early Bronze Age, 3200 to 2200 B.C., was a period of large-scale urban expansion. At the same time and locations, the construction of dolmans and other megalithic structures blossomed,” pointed out Maltsberger, associate professor for biblical studies and archaeology at BUA. 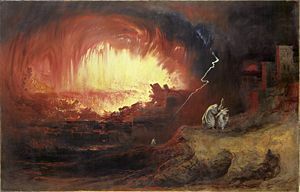 Because calendars are mentioned throughout the Hebrew scriptures, it would make sense that various ones would be found in the area near Sodom. Such as the lands currently occupied by the Jews, the Palestinians, and the Jordanians. This entry was posted on Friday, June 22nd, 2012 at 10:25 am	and is filed under Old Testament History.